Dunnellon, Florida — Dunnellon Police Officer Adam Robinson responded to a Circle K, located at 11946 U.S. Highway 41, in reference to a woman passed out in the bathroom. Upon arrival, a witness told Officer Robinson that a woman, later identified as Jessica K. McDowell, 29, was in the bathroom unresponsive. The witness told the officer that McDowell had been in the restroom “a very long time,” and when she knocked on the door McDowell would not answer. According to reports, Officer Robinson banged on the door and could hear what sounded like McDowell sliding on the floor. Officer Robinson reported that when McDowell finally opened the door he immediately recognized her from previous run-ins with law enforcement. According to Officer Robinson, McDowell appeared severely impaired as she attempted to walk out of the restroom. As McDowell exited the restroom, the officer looked in and saw a hypodermic syringe with blood and an unknown substance inside it. McDowell then attempted to flee the store, at which time Officer Robinson detained her. Upon searching her purse the officer found a Walmart Pharmacy bottle that contained five xanax and three hydrocodone pills. The label on the bottle did not match the contents inside it. The officer also found a spoon with a narcotic residue on it, and a baggie of cocaine. McDowell was then placed in handcuffs and arrested. As McDowell was being booked into the Marion County Jail, officers found approximately 1.1 grams of methamphetamine hidden on her person. During her arrest she admitted to “shooting up” in the bathroom of the Circle K.
McDowell was charged with Possession of Cocaine, Possession of Drug Paraphernalia (x3), Possession of a Controlled Substance without a Prescription (x2), Possession of Methamphetamine, and Smuggling Contraband into a Detention Facility. She is being held on $12,300 bond. Over the past seven years McDowell has been convicted of Fraud, Armed Robbery Home Invasion with a Firearm, Armed Burglary with a Firearm, Dealing in Stolen Property, Grand Theft Auto, Maintaining a House for Prostitution, Prostitution, and multiple Probation Violations. 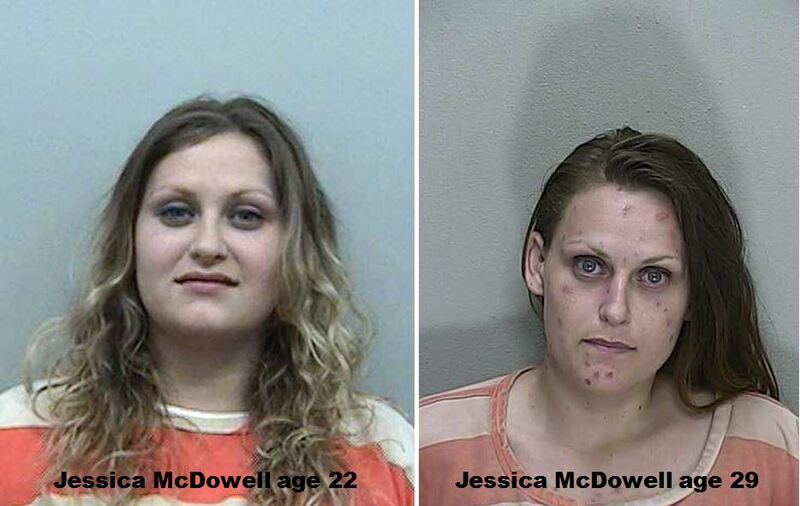 Police said Mcdowell has been a drug user for the past several years.